Catapult King for iPhone, iPod Touch, and iPad is a fun physics-controlled game with striking graphics, refreshing achievements, and smart gesture controls. This is a universal download smart enough for sophisticated gamers and cute enough to entice young children. The Catapult King iPhone app’s unusually long load time reveals a bright fairy tale world reminiscent of Shrek. A dragon has captured the princess, and it’s your job to get her back by taking down the dragon’s goofy minions. 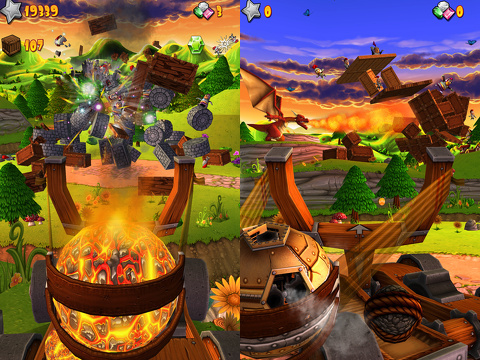 Before each level, there is a sweeping film-like introduction to view the tower you will need to destroy. The music and atmosphere is hopeful and dynamic, as well as free of blood and guts. One of the great features is your ability to examine the tower and fairy tale world by pinching, expanding, and rotating your fingers on the screen. It also enhances your game play, as you can identify the weaker aspects of the structure. As you progress through the 64 levels, you will appreciate this feature more. The towers and structures become more complex, and you want to take it out with speed and efficiency. With the Catapult King, you will achieve new levels, high points, and special powers quickly. And, if you don’t, you can always purchase them. The gesture controls for slinging the catapult are extremely agile and responsive. You can adjust the cog to refine your angle and distance with a touch on the screen. 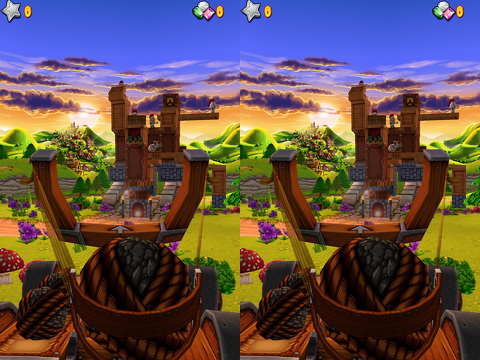 When you use the catapult’s physics-controlled gesture, you can easily adjust the direction without a misfire. When you release your finger, hopefully, you knock down the tower, topple the dragon’s army, and get some of the jewels and items plundered by the dragon. You unlock items and spells with your earned points including magic arrows for greater precision, destructive meteor strikes, and earthquake shakes. At the end of each success, you can check out your statistics and successes. You can also share with Facebook and Twitter, as well as connect with Game Center. One other great feature is the list icon. It shows a matrix grid of all of the levels you have unlocked or not. Many games require you to constantly return to that grid, or that grid muddies the screen sharing your game winnings. The Catapult King game for iPhone, iPod Touch, and iPad is an incredible, accessible, and fun game for the much too low price of free. AppSafari review of Catapult King was written by Jenni Ward on August 1st, 2012 and categorized under Action, App Store, Featured, Free, Games, iPad apps, Kids, Physics Based, Universal. Page viewed 4801 times, 1 so far today. Need help on using these apps? Please read the Help Page.